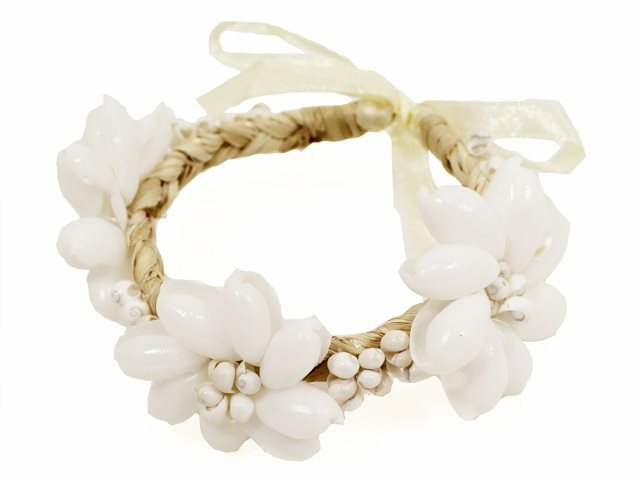 This Tiare Shell Bracelet is made with braided raffia, moon shells, and mongo shells. The diameter of the tiare ornament is about 1.25 inches (3.8cm). Beautiful shell bracelet! Right on trend now!! I love it! This goes so well with the Mongoshell Ring Lei and looks beautiful on my wrist. Bought for each female as a gift who will be attending 50 year vow renewal in October in Hawaii. My son loves his bracelet. He can wear it anything he wears. I am so happy with it! Its perfect! I was so happy with my purchase! It goes perfectly with my outfits!